Back in 2009, I had the privilege of traveling around the United States to research a documentary about honeybees and other pollinators dying off thereby leaving humanity without a third of its food supply. We called it American Colonies: Collapse of the Bee, and with cameras rolling, we posed questions to experts at Penn State University, the Florida Department of Agriculture and the USDA in Beltsville, Maryland amongst other institutions. I learned about the value of an amazing creature and much, much more. If you haven’t already heard about the ins and outs of Colony Collapse Disorder (CCD), you certainly will soon. 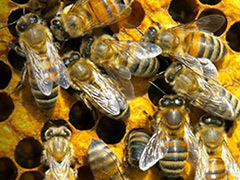 This umbrella term for the modern diaspora of honeybees is resurging. TIME Magazine recently made Bryan Walsh’s “The Plight of the Honeybee” a cover story, and The Guardian has implemented a weekly bee update entitled Buzzfeeds to encourage ongoing discussion. This is all well and good, but perhaps because the blogosphere is now so flooded with concern, it seems as if there almost too much information out there (credible or not). An early and ridiculous theory suggested that honeybees were getting lost and confused by cellphone signals. It’s true, however, that there is no one cause for colony collapse disorder. But, some factors deserve more of the blame than others. As we understood it, systemic pesticides (or tank mixes of various pesticides and fungicides) are the main culprit. Symbiotic and unforeseen interactions between chemicals have caused the bees to react adversely. Either way, the causes and potential solutions for CCD is not a static subject. And, in the spirit of The Guardian’s ongoing discussion forum, we will continue to provide more articles and information about this pressing matter as the dimensions of the issue expand and evolve. Be sure to check back. Posted on October 4th under Global Ecology.